Arthur married Margaret A. Burns. Arthur Chester Woodward died in October, 1918 at age 32, in the influenza pandemic. Robert Burns Woodward+ b. April 10, 1917, d. July 8, 1979;Only child. Massachusetts Vital Records, 1841-1910, , Vol: 360 ; Page: 209. The Boston Directory, Boston, Mass. : Sampson & Murdock Company, , 1908-09. 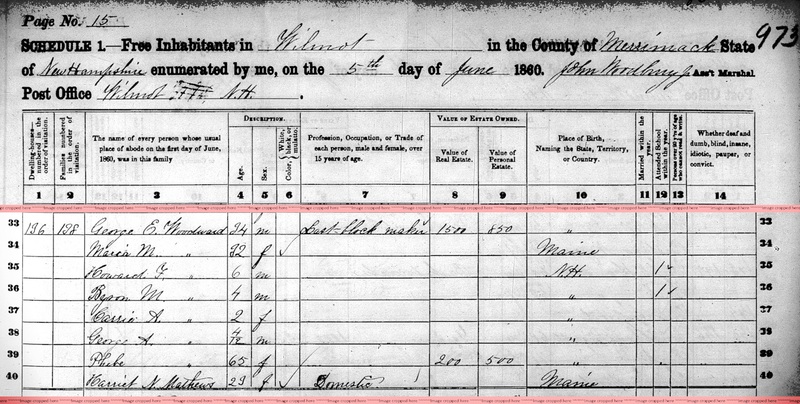 He appeared on the census of 1810 at Brookline, Massachusetts; see 1810 census page 563. Vital Records of Needham, Massachusetts: Births to 1845, Marriages to 1850, Deaths to 1850, Needham (Mass. ), (1959) , p. 74. 1800 United States. Census Office. 2nd census, Census schedules, 1800, Washington [District of Columbia]: National Archives. Central Plains Region,, (1949, 1958-1960) , refer to census page 148. 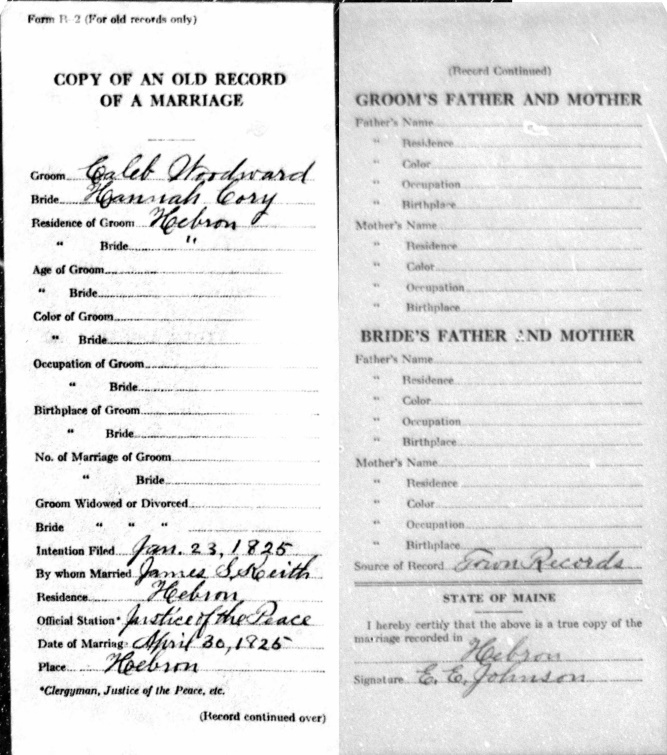 "New Hampshire Birth Records, Early to 1900," database with images, FamilySearch (https://familysearch.org/ark:/61903/1:1:FL5S-K6X : 12 December 2014), Woodward, 17 Mar 1882; citing Wentworth, Grafton, New Hampshire, United States, Bureau of Vital Records and Health Statistics, Concord; FHL microfilm 1,001,056. 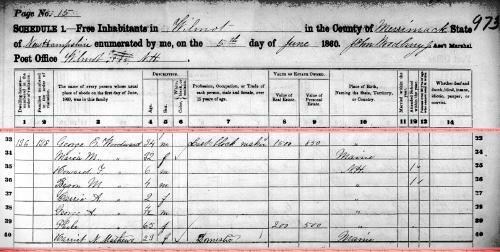 Benjamin Woodward was born on May 19, 1786 in Bellingham, Massachusetts. He is the son of Robert Eugene Woodward and Gloria K. Pierce. Benjamin Robert Woodward is online at https://www.facebook.com/ben.woodward.357. She was the daughter of John Chever Woodward and Releaf Whitney. Newton (Mass. 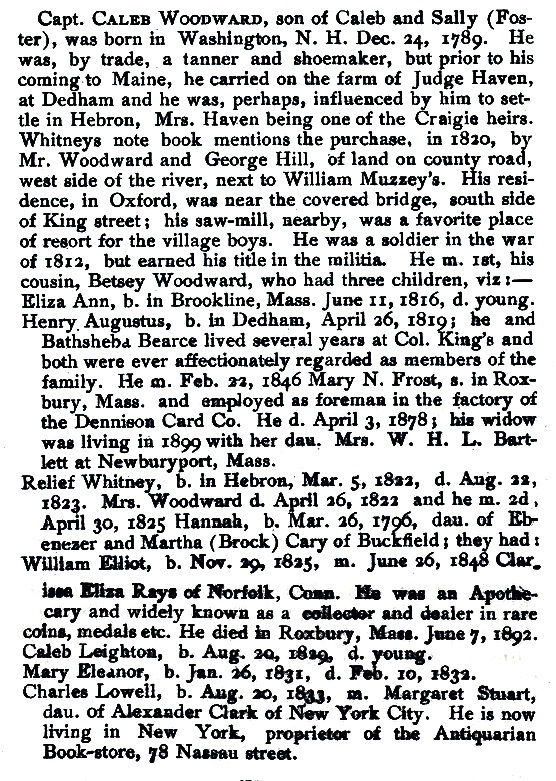 ), Vital records of Newton, Massachusetts, to the year 1850, Boston: New England historic genealogical society, at the charge of the Eddy town-record fund, (1905) , p. 223. Newton (Mass. ), , p. 412. 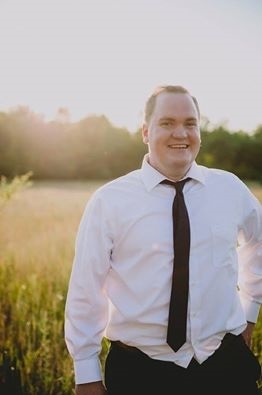 Brian Donald Woodward is online at https://www.facebook.com/brian.woodward.359. 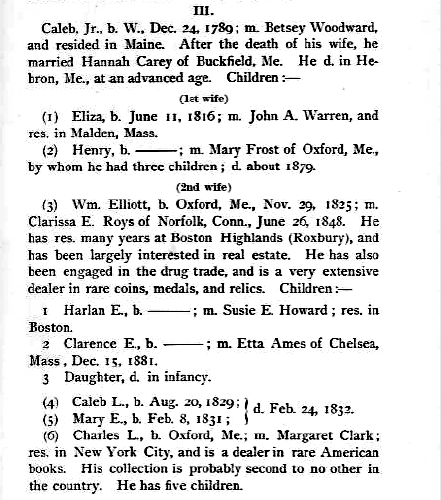 "New Hampshire, Death Records, 1654-1947," index and images, FamilySearch (https://familysearch.org/pal:/MM9.1.1/FSVP-TL1 : accessed 09 Dec 2012), Geo. E. Woodward in entry for Bert E. Woodward, 27 Mar 1916. 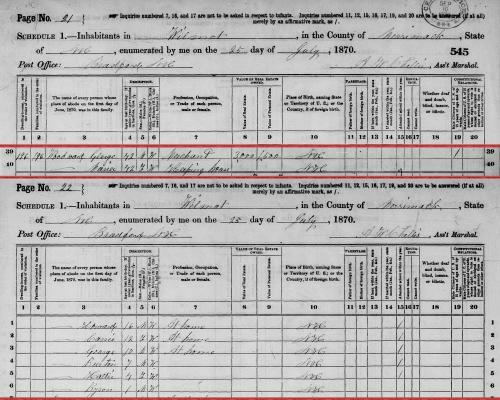 "United States Census, 1880," database with images, FamilySearch (https://familysearch.org/ark:/61903/1:1:MHRL-1N4 : 11 August 2016), George E Woodward, Wilmot, Merrimack, New Hampshire, United States; citing enumeration district ED 195, sheet 504C, NARA microfilm publication T9 (Washington D.C.: National Archives and Records Administration, n.d.), roll 0766; FHL microfilm 1,254,766. Byron M. Woodward was born on July 24, 1855 in Wilmot, Merrimack County, New Hampshire. Byron died before August 20, 1915. 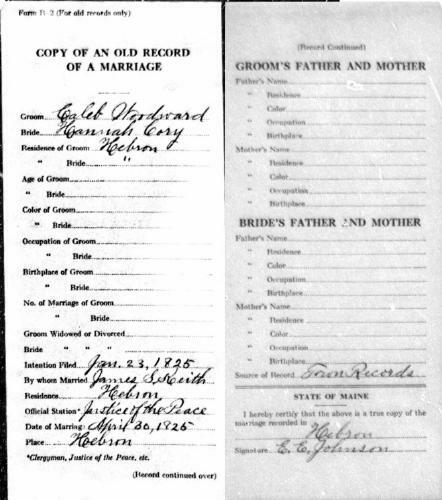 "Massachusetts, Marriages, 1841-1915," index and images, FamilySearch (https://familysearch.org/pal:/MM9.1.1/N4HB-82N : accessed 09 Dec 2012), George E. Woodward in entry for Byron Mason Woodward and Letitia D. Thurston, 1902. "New Hampshire, Death Records, 1654-1947," index and images, FamilySearch (https://familysearch.org/pal:/MM9.1.1/FSVP-TGC : accessed 09 Dec 2012), George E. Woodward in entry for Byron M. Woodward, 20 Aug 1915. 1910 United States. Bureau of the Census. 13th census, 1910 population census schedules, Washington, District of Columbia: Bureau of Census Micro-Film Lab, ([19--?]) 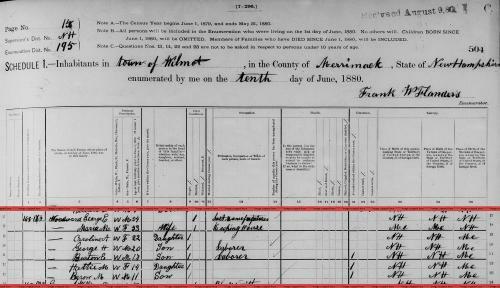 , Census Place: Wilmot, Merrimack, New Hampshire; Roll: T624_865; Page: 8A; Enumeration District: 0231; FHL microfilm: 1374878. 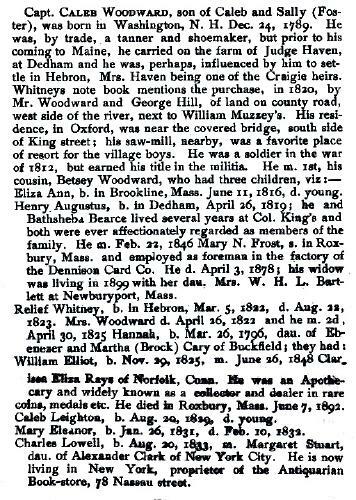 Vital Records of Bellingham, Massachusetts, to the Year 1850, Boston: New-England historic genealogical Society, at the charge of the Eddy town-record fund, (1904) , p. 110. And at another time, a member of at First Parish Church, Brookline, Massachusetts. 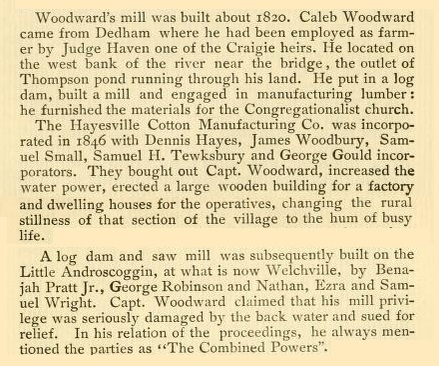 1846 his sawmill was bought out by the Hayesville Cotton Mfg. 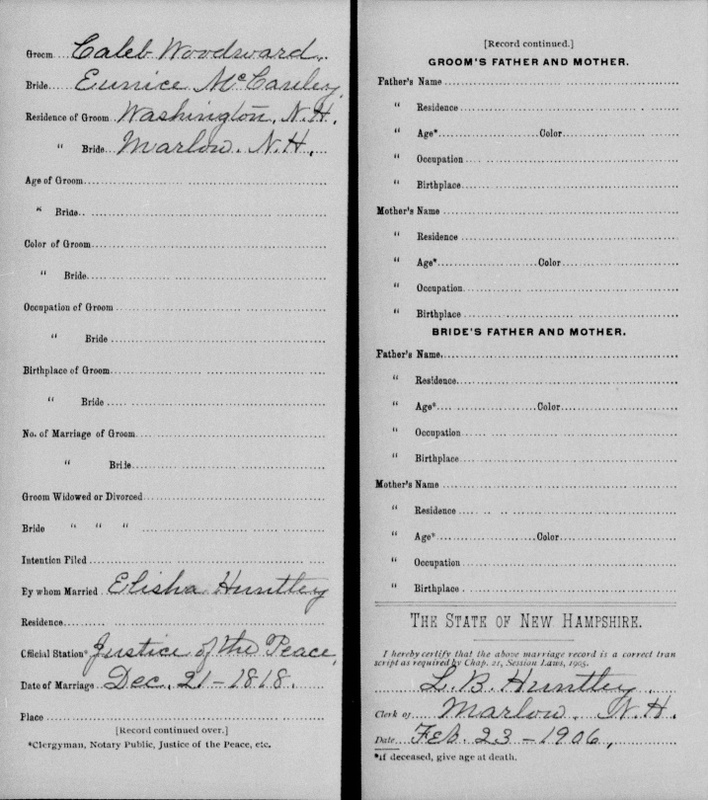 Co.
"New Hampshire, Birth Records, Early to 1900," index and images, FamilySearch (https://familysearch.org/pal:/MM9.1.1/FL5S-2JR : accessed 09 May 2014), Caleb Woodward, 24 Dec 1789; citing Washington, Sullivan, New Hampshire, United States, Vital Records and Health Statistics, Concord; FHL microfilm 1001056. Newton (Mass. 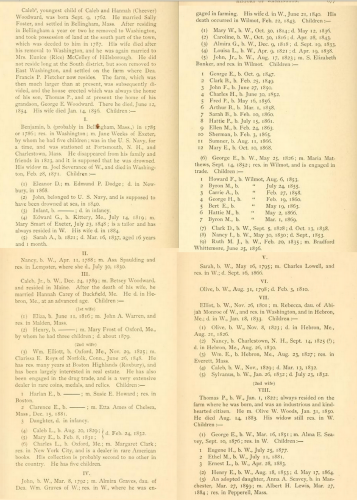 ), Vital records of Newton, Massachusetts, to the year 1850, Boston: New England historic genealogical society, at the charge of the Eddy town-record fund, (1905) , p. 412. She was the daughter of George E. Woodward and Maria E. Matthews. 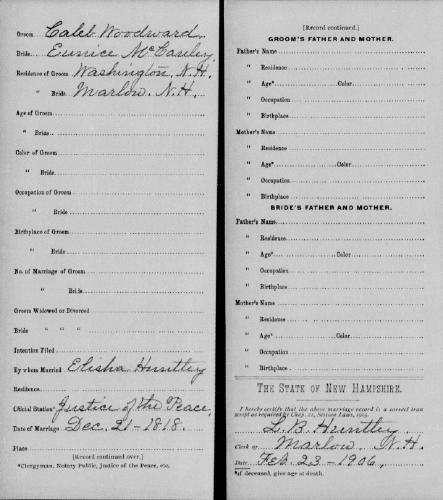 "United States Census, 1900," database with images, FamilySearch (https://familysearch.org/ark:/61903/1:1:M95D-CC6 : accessed 25 August 2015), Patrick H Cahoon, Harwich Town (east part), Barnstable, Massachusetts, United States; citing sheet 7B, family 221, NARA microfilm publication T623 (Washington, D.C.: National Archives and Records Administration, n.d.); FHL microfilm 1,240,631. Massachusetts Vital Records, 1841-1910, , Vol: 352 ; Page: 13. 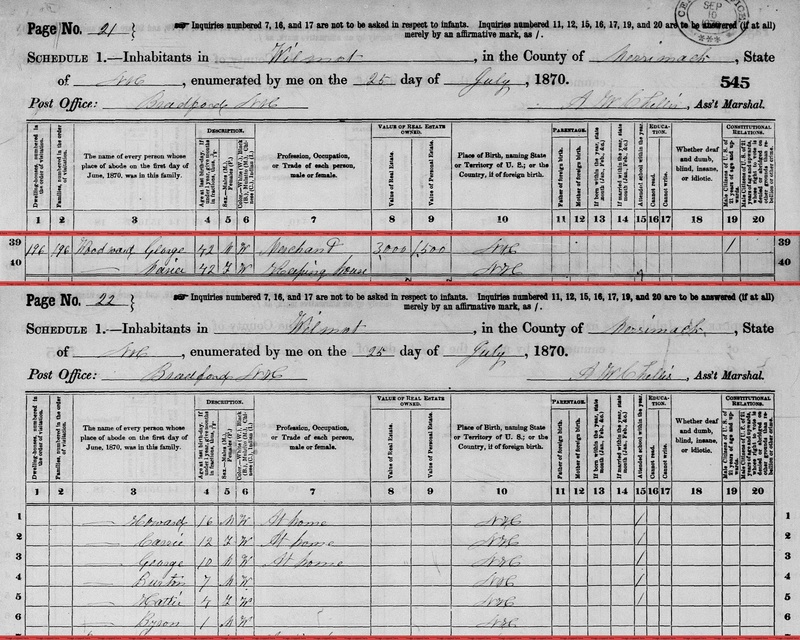 "United States Census, 1910," database with images, FamilySearch (https://familysearch.org/ark:/61903/1:1:M2N6-Y7H : accessed 25 August 2015), Carrie A Cahoon in household of Patrick H Cahoon, Harwich, Barnstable, Massachusetts, United States; citing enumeration district (ED) 11, sheet 1B, family 29, NARA microfilm publication T624 (Washington, D.C.: National Archives and Records Administration, n.d.); FHL microfilm 1,374,584. 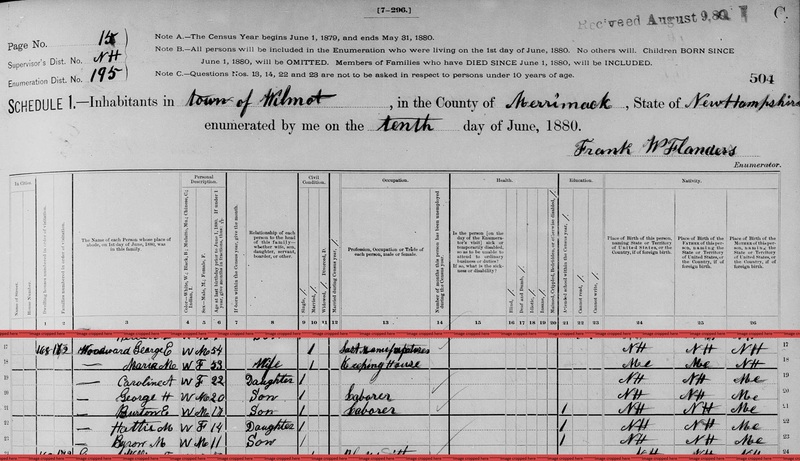 "United States Census, 1920," database with images, FamilySearch (https://familysearch.org/ark:/61903/1:1:MXTN-6L7 : accessed 25 August 2015), Carrie A Cahoon in household of Patrick H Cahoon, Harwich, Barnstable, Massachusetts, United States; citing sheet 3B, family 85, NARA microfilm publication T625 (Washington D.C.: National Archives and Records Administration, n.d.); FHL microfilm 1,820,679. 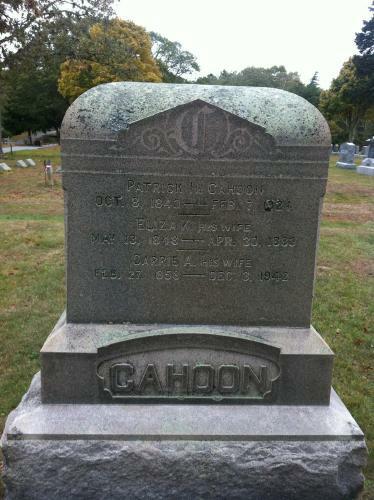 "BillionGraves Index," database, FamilySearch (https://familysearch.org/ark:/61903/1:1:2HF4-M1H : accessed 25 August 2015), Patrick H Cahoon, died 07 Feb 1924; citing BillionGraves (http://www.billiongraves.com : 2012), Burial at Island Pond Cemetery, Harwich Center, Barnstable, Massachusetts, United States. 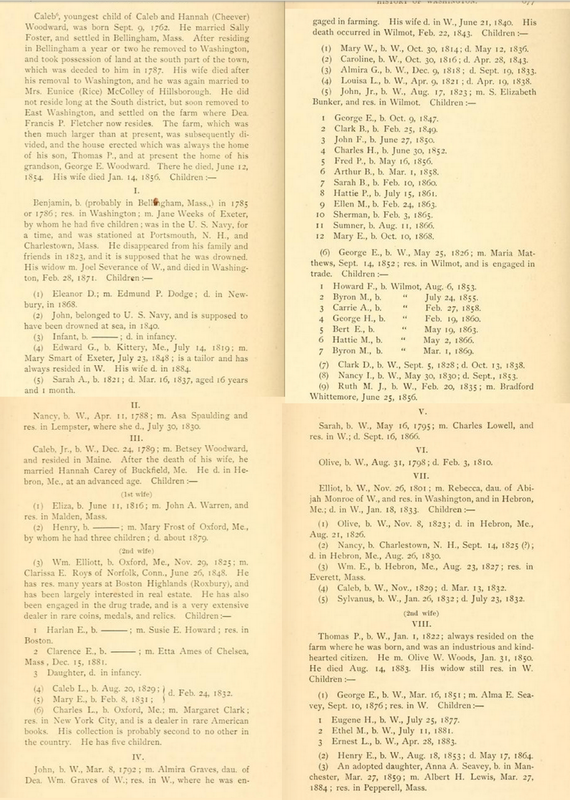 "Massachusetts Births, 1841-1915", database with images, FamilySearch (https://familysearch.org/ark:/61903/1:1:FXDN-TQX : 1 March 2016), Harry S. Cahoon, 1885. "Massachusetts Births, 1841-1915", database with images, FamilySearch (https://familysearch.org/ark:/61903/1:1:FX64-16J : 1 March 2016), Eliza E. Cahoon, 1888.